Distributed database provider TransLattice is taking the fight to Oracle and IBM: it's breaking its TransLattice Elastic Database, or TED, free of its database appliances and selling it on bare metal or virtual machine instances. TransLattice was founded in November 2007 and came out of stealth mode in August 2010. The company was founded by Frank Huerta (CEO), Michael Lyle (CTO), and Robert Geiger (VP of engineering) - all veteran IT execs who formed Recourse Technologies a decade earlier to create a distributed threat security and network intrusion system, which Symantec bought in 2002 for $135m in cash. All three have deep expertise in distributed systems, and have applied those skills to distributed databases. Having seen what the three founders were up to, which was turning the open-source PostgreSQL database into an inherently scalable and resilient database and application runtime platform, private equity firm DCM kicked in $9.5m in Series A funding in August 2008 to the 25-person startup. TransLattice started ramping up sales into the enterprise last July with the debut of its TransLattice Application Platform 2.0, an appliance server based on Dell PowerEdge servers as well as a Xen-based virtual machine version of the distributed database that was deployable on Amazon's EC2 compute cloud. After pushing the appliance variant of the database for a bit and beefing up the SQL capabilities of the TransLattice database, Lyle tells El Reg that the company is now ready to sell its distributed database as free-standing code that companies can deploy on their own X86 boxes, either on bare metal or on virtualised instances running atop VMware's ESXi hypervisor. Lyle says that about half of the internal development systems are based on Red Hat's KVM hypervisor, so getting the distributed database certified on KVM is just a matter of time and paperwork since the company already knows it works. The TransLattice Elastic Database announced today is at the 2.5 release level, and Lyle says that the company has made "major strides" in the amount of SQL and database primitives that the database supports. He's comfortable selling the database as a standalone product rather than as a foundational element of its appliance platform, which was sold as a J2EE framework based on Enterprise JavaBeans and Java ServerPages. Not everyone wants to re-certify their applications on this Java environment, and so TransLattice is offering the underlying database as a product in its own right. TransLattice Elastic Database 2.5 has PostgreSQL 9.0 as its foundation, and the upper levels of the database management system look and smell like normal Postgres. But the underlying guts of the database, including the locking mechanisms and data storage methods, have been completely replaced with a new set of code. 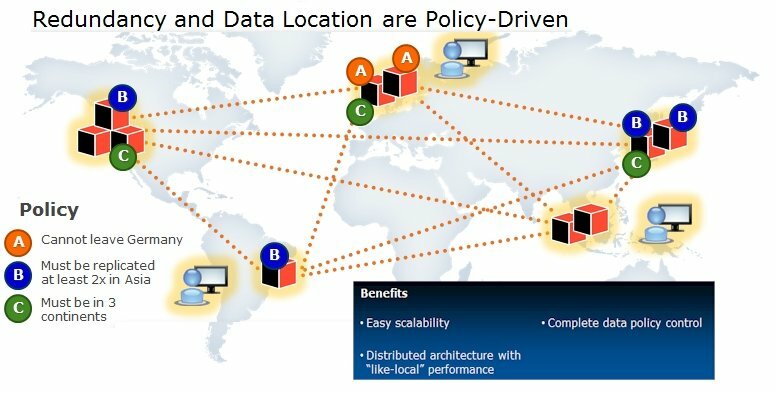 This new software can create a database cluster like Oracle's Real Application Clusters (RAC) or IBM's PureScale for DB2, and do policy-driven database sharding - effectively partitioning databases and spreading bits of them over multiple servers - as well as replication over a wide-area network. Companies can therefore craft a geographically distributed processing environment that can also stay in compliance with government and company regulations about what data can be where and what transactions can be done in what locations in the world. The modified Postgres database created by TransLattice has what the company calls a distributed global consensus protocol that is used to commit transactions across the nodes in the cluster and deal with dependences. The first and important thing is that data underneath the tweaked Postgres is sharded, with multiple pieces of tables stored on many different nodes across the cluster. The nodes can be in the same room, like RAC or PureScale clusters, or they can be spread around the world and linked by wide-area networks. With normal database clusters, you have to keep the nodes within 200 feet or so of each other or the latencies have a dramatically bad effect on performance, says Lyle. The TransLattice Elastic Database uses rules set by system and database administrators to determine the level of replication and resilience necessary for the company's applications, and then watches how transactions are actually run and moves database shards to they can be local for processing in each geographical region. This is all done transparently to the users and applications, which just see one great big honking PostgreSQL database. An important thing about the TED database is that it also has policy controls that limit where data and transactions can be pushed to across the geographically distributed database cluster. So, for instance, you can say that a certain subset of data can never leave Germany and any transactions against that data have to be done on physical systems located in Germany. Next page: Clusters, clusters everywhere, but how to keep them in synch?